Alliance Logistics allows companies to enhance asset management, wherever product resides. It enables a reduction in inventory costs while ensuring stock levels and movements keep pace with service and sales activities. 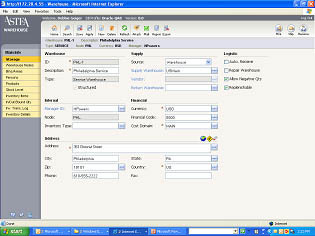 It allows for parts management for effective field service delivery and SLA compliance. Cost management improves cash flow by streamlining and shortening the cycles from inventory to usage to billing. Alliance Logistics allows companies to enhance asset management, wherever product resides – remote warehouses, service vans, spares pools, or parts exchanges. It enables a reduction in inventory costs while ensuring stock levels and movements keep pace with service and sales activities. It allows for parts management for effective field service delivery and SLA compliance. Cost management improves cash flow by streamlining and shortening the cycles from inventory to usage to billing. As a result, lower logistics costs open opportunities to recognize higher margins on products and services. Alliance Logistics supports multiple warehousing strategies: centralized, regional, repair depot, and service agents’ mobile inventories including kits and tools. Item transaction logs track movements, including in-transit stock. Color-coded priority queues expedite key orders through warehouse operations.